Providing you the best range of jute grocery bag with effective & timely delivery. 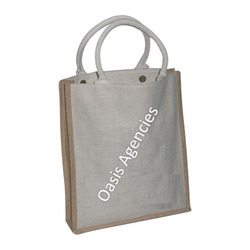 We are one of the leading manufacturer of Medium Size Jute Grocery Bag. Our clients can avail from us a highly effective range of Jute Grocery Bag Medium has a flawless and an elegant look. These bags are available in various sizes, shapes and design as per the clients’ requirements and needs. We export these products, which are tremendously demanded due to their durability, long lasting, easy to carry and huge storage. Our clients can avail from us these products at most reasonable prices. 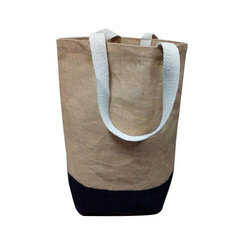 The exciting and rich finish based Natural White Cotton Tape Handle Jute Grocery Bag options are made from quality jute material in contemporary designs. The use of jute as a construction material also makes these grocery bags eco-friendly as well as completely recyclable. Being highly preferred by today’s environment conscious generation, these bags also provide for distinct style as well as meet the demands of updated fashion statement. Some of its features include contemporary styles, offering superior fashion statement as per the current trends, providing for fashion and environmentally conscious usage, excusive finish and design standards, eco friendly usage option and others.